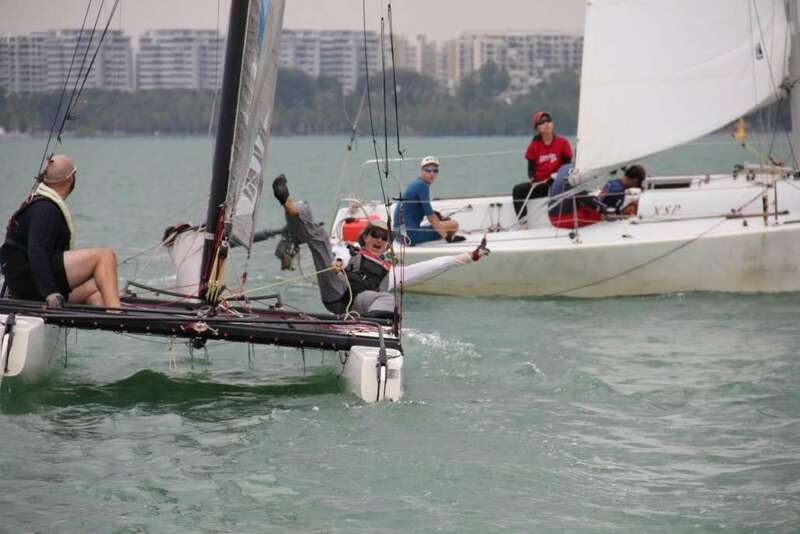 With the North-East Monsoon Season finally over, sailors participating in the first Sunday Series Race of 2019 had to contend with tricky wind conditions on course 5, a refreshing change from the windward leewards between Ubin & Tekong. The Multihulls seemed visibly tired/exhausted from the past 3 months of racing, as only 2 Beach Catamarans and 1 Trimaran took to the start line. Kaze Kat and Persian Cat were a Nacra 20 and Nacra 5.0 respectively, 2 very different designs from the same company. The former claimed line honours comfortably, and won the race by a slimmer margin after handicap. Chris Waddington’s solo sail on Persian Cat marked her return to racing, we’re excited to see more of Persian Cat over the next 2 months! In the PY Class, 9 boats contested for podium – and the flames of competition were ignited at the start-line. With it being a downwind start and winds shifting south-south east, sailors tussled for their favoured spot on the line, eventually erupting into a near-collision at the pin-end. Brio emerged 3rd in the fleet after handicap, a few minutes behind 2nd placed Minx. Southern Light continue their winning ways from the recently concluded SailFest Regatta, scoring their first bullet for the Series after corrected time. Red Rum executed a perfect port tack start, leading the IRC Fleet from start to finish to secure a comfortable win ahead of Shardana and Born in Fire in 2nd & 3rd respectively. Big thank you to International Jury, Uncle Hong Kit for once again chairing the Protest Committee, together with Jury Members Edwin & Bryan. Thank you everyone for joining us for the first Sunday Series of 2019! We look forward to a delightful afternoon on 30th March, Saturday, where we commence the 1st Lady Helm Race at Changi Sailing Club!